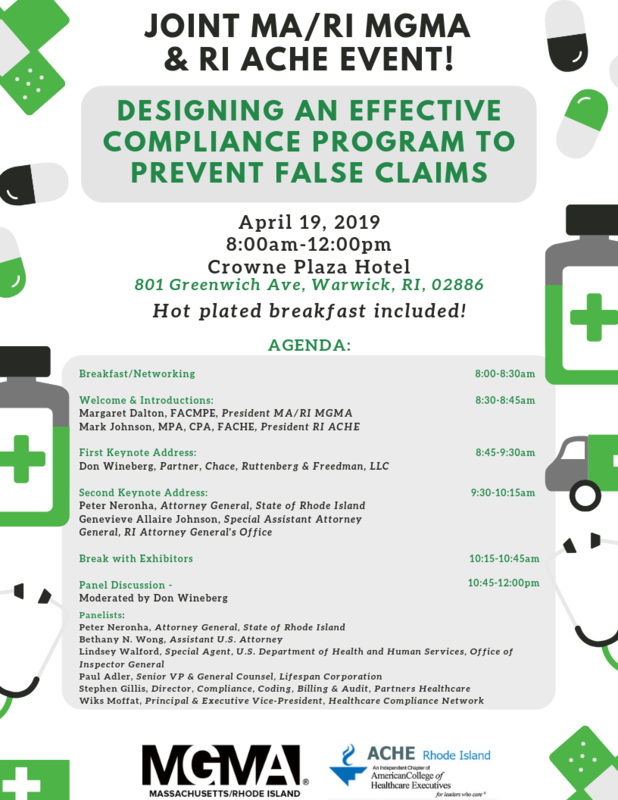 False claims enforcement in the healthcare industry has substantially increased in the last few years and has expanding from pharmaceutical companies and medical devices to physician groups, nursing homes, rehabilitation facilities, medical records, managed care and hospitals. Join us for an informative session with two experts in this field. Don Wineberg’s keynote address will cover awareness of various solutions and traps in Stark and Anti-Kickback Law compliance, thoughts on how the whistleblower (qui tam) cases work, and how to minimize whistleblower claims and respond to those that are made. Peter Neronha’s address will focus on health care initiatives in the Attorney General’s office going forward, while Adi Goldstein, Deputy Attorney General and former head of the RI US Attorney’s Office Healthcare Fraud efforts will provide a perspective on how that office sees and processes health care compliance issues. 1.5 hours of ACHE face-to-face credits and 1.5 hours of ACHE Qualified credit will be available.